DUNKIRK is in 6 Formats, Where Should You Experience It? When Christopher Nolan’s Interstellar opened in 2014 we asked bay area projectionist Chris Rasmussen (a cinematographer and technician who installs, maintains and projects digital, 70mm and 35mm) to watch the movie in a variety of projected formats and he offered an insider’s view. We also told a story of a 70mm IMAX screening gone very wrong. But between all his work and watching it in five different formats his insightful story also took a week to get finished and published. And we know that you want to make a decision about where to see Nolan’s Dunkirk now. Nolan shot Dunkirk on both 70mm (actually 65mm with the other 5mm left for soundtrack information) and IMAX film. You can choose to see it on IMAX 70mm film, IMAX with Laser, IMAX Xenon, traditional 70mm, 35mm, and DCP ( standard “digital cinema package”). Alissa Wilkinson at Vox has done a terrific job of researching and providing information on the many choices you have about how to watch this movie that demands to be seen on the big screen. Check it out here. 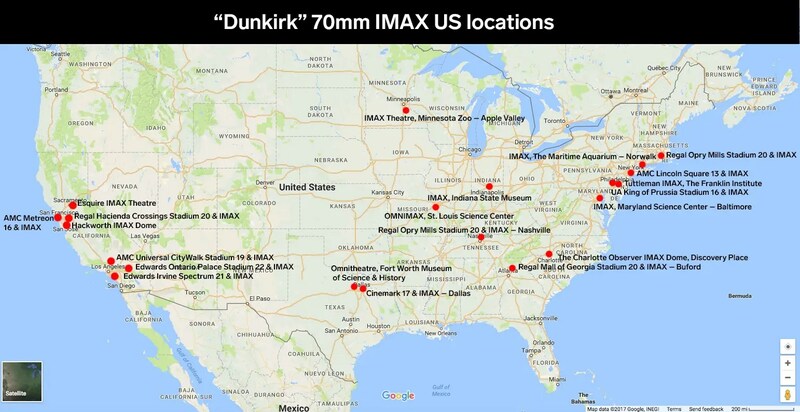 But do not trust the links (and map below) provided by Warner Brothers for where to see which format as they are incomplete. As of this writing, for example, Oakland’s Grand Lake Theater is not listed. Check your local cinema’s websites. Interview with director Christopher Nolan and actors Mark Rylance, Barry Keoghan, Jack Lowden and Fionn Whitehead. Courtesy of the British Library. Visit for more information and newspapers. In depth interview on BBC.